As access to the Internet becomes more widespread with faster, more reliable and ‘always on’ connections becoming the norm the growth of applications using the hosted application model continues to expand. Although hosted applications will not suit every situation, or every customer, they offer many individuals and organizations, as well as the application manufacturers’ themselves, considerable benefits over the locally installed application. A hosted application, also known as Internet-based application, web-based application, online application and Application Service Providers (ASPs) are software applications where the software resides on servers that are accessed through the Internet instead of the more traditional software that is installed on either a local server or on individual PCs. The thin client concept is nothing new but advances in Internet connectivity have allowed the application to move from a local server to a server on the Internet. An example of hosted applications would be Salesforce.com that provides customer relationship management facilities, Netsuite offering all-in-one business management applications and SurveyGalaxy.com that provides their customers with an enterprise survey and questionnaires application. Reduced costs, instant deployment, easier to maintain and reduced administration are among some of the main benefits. With hosted applications the hardware and software is the responsibility of the vendor with the client only having to maintain access to the Internet. As there is no software to download a hosted application can be made instantly available across an entire organization even where the organization has multiple regional and international offices. As there is no software the considerable time and resources required for periodic updates is also completely eliminated. The need to license software through a ‘per use,’ ‘per concurrent user,’ ‘per server’ or ‘site’ license has been eliminated. Although some hosted applications still do charge ‘per user’ many have taken the opportunity to charge on a ‘usage’ and/or ‘period’ basis meaning that the customer does not have to estimate the number of licenses that will be required, nor install and pay for full licenses that may only be used by some employees occasionally. 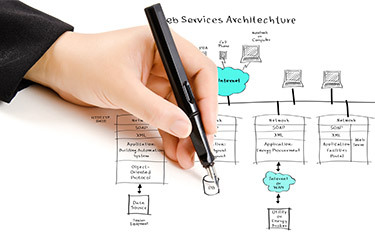 This hosted application model also allows the smaller organization and sole trader access to applications written using advanced software development tools and that utilize sophisticated database technology and high-end servers. The capital investment of the hardware and software as well as the security, backup and server maintenance cost are all the responsibility of the vendor.